The Berries: CAP Harvest Berry is the real star here. A bright mix of blackberry, blueberry, raspberry and strawberry. I get mostly the blackberry and raspberry from it, but others perceive more strawberry. I found that with the bulked version of the cheesecake base that even at 3.5% Harvest Berry just wasn't showing through as much as I wanted, so it's bolstered by it's FA counterpart Forrest Mix. Another berry blend with a very similar profile it's a perfect fit. At 1.25% it's just enough to drive those berry notes to the top, but without getting muddy or perfumey, which is what I got if I started taking Harvest Berry up to the 4% or higher range. If you want a little more variety you can easily sub the Forrest Mix for FW Blueberry, your favorite Strawberry, FA Raspberry, or a splash of citrus like TFA Key Lime, INW Lime, INW/FE Lemon, or FA Lemon Sicily. Perfect! 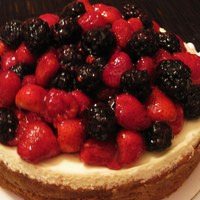 For me the balance between the berries and the cheesecake is just right. The berries are bright and authentic tasting. Thank you for the recipe.